I met Mark Atwood at Metrix recently and he told me about an interesting problem he was experiencing at his home. He lives in a house with several people, and they’re always having visitors. The problem with this was keeping track of keys. He didn’t want to keep his house unlocked all the time, but he also didn’t want to rekey the house. What’s his solution? Neat technology of course! He’s creating an RFID reader that will work with any MIFARE card (which includes ORCA cards, some RFID credit cards, and some work and school cards) so that he has an easy way of adding and deleting people from those allowed in the house without needing to buy keys or locks all the time! Mark has been working on this project off and on for a couple of weeks now, and just has a little bit left to go. He was able to buy the parts online for pretty cheap and has all the hardware already. He’s currently having problems reading the interface to the I2C in the MIFARE reader, but only has a couple of hours of work to get that sorted out. He said that one day he’d like to get people’s serial number from the card ahead of time so that they can be in the system before they even arrive at the house! Pretty cool, but probably a future add-on. 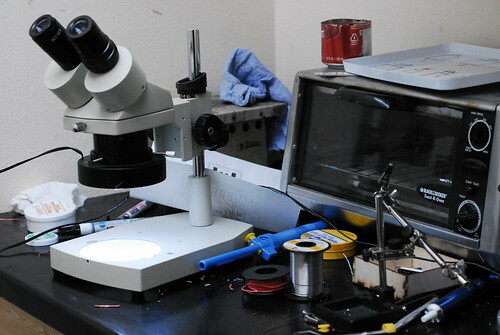 He’s working at Metrix because he wants to rent wire cutters to make a punchboard, and will be using the soldering station to solder everything together. Metrix is also a good place for him to come and make software as there is free fast wifi and he doesn’t have to buy coffee every hour, like at some coffee shops. While the project itself is interesting, so were people’s reactions to the idea. He told me that many people think a lock mechanism like this is insecure. First, it makes me wonder if these people have been to a modern office building (as I think all of them use a keycard system). Secondly, why do they think a traditional key is better? Plenty of people (especially in the hacker community) know how to pick a lock. It seems that the average robber might be befuddled by a non-traditional key system. Of course, none of it matters if your window’s open! 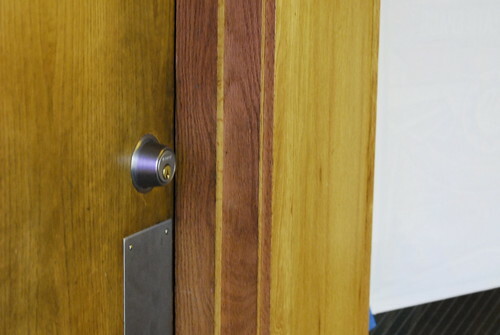 You can never be 100% secure, but I think this is a pretty inventive way of keeping a lock on the door while making it easy on those who are allowed to enter. I’ve seen some other non-traditional house key systems such as with a number pad instead of keyhole, so I wonder if it’s a growing trend. I think it makes sense. If you lose your house key, it’s still usable unless you change your locks. 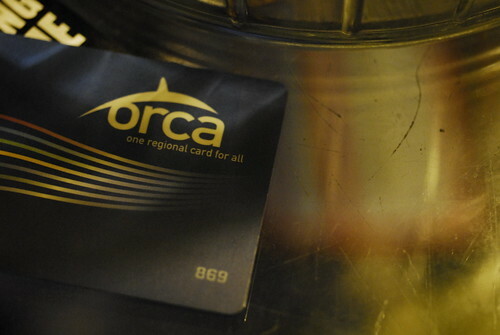 If you lose your ORCA card, you can remove it from the database. I just saw some fingerprint scanners for sale cheap online, maybe that’s next!